Somehow, we're well into August and summer break will be over before we know it. It's been a busy - but very productive - summer for us but I'm looking forward to a slower pace in the next few weeks. We just got back from a very relaxing vacation in Turks & Caicos. It takes some adjustment to come back from paradise but it's always good to be home! Before we left, my little one and I made some popsicles for our latest kitchen collaboration. 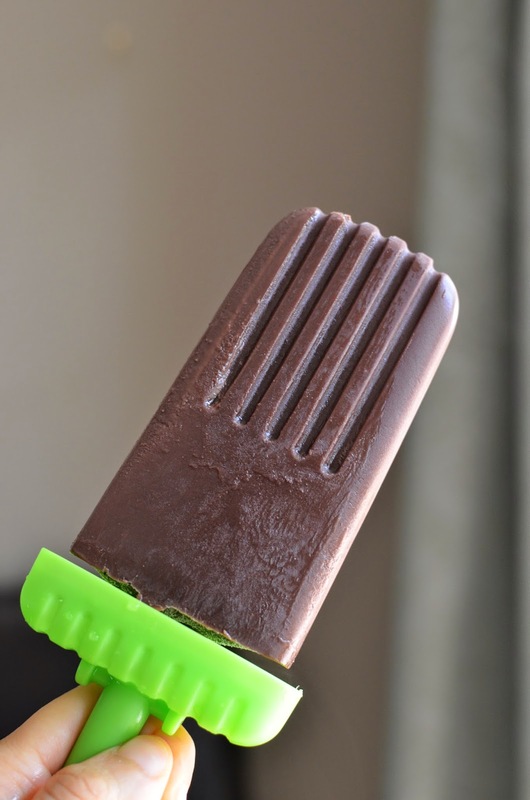 We made some delicious, relatively light yet seriously satisfying, chocolate pudding popsicles. I mentioned that I've been doing some cooking projects with my little guy. I've been trying to build his interest and attempting to teach him some basic skills and ideas about cooking. So I try to entice him with simple cooking projects that can hold his attention (a 9-year old boy's attention span is short!) and will result in things he likes to eat. Well, this time it was chocolate pudding pops. My son loves chocolate almost as much as I do, and he particularly loves this chocolate pudding pie that I've been making on repeat lately so it got me thinking about making some chocolate pudding pops with him. I've made fudge pops before and, to be honest, I'm not altogether sure if there's a difference between "fudge pops" and "chocolate pudding pops" when you hear those terms being used. The two recipes I've now tried are a bit different but I think we tend to use the two names interchangeably. Anyone care to enlighten me? Anyway, maybe it's the magic of working with your child but all I can say is these were the best chocolate pudding pops I've had and helped to make. I decided on a simple recipe from Cooking Light, which calls for low-fat milk, a good dose of cocoa, and some bittersweet chocolate. A touch of cornstarch and an egg yolk give it some more body. 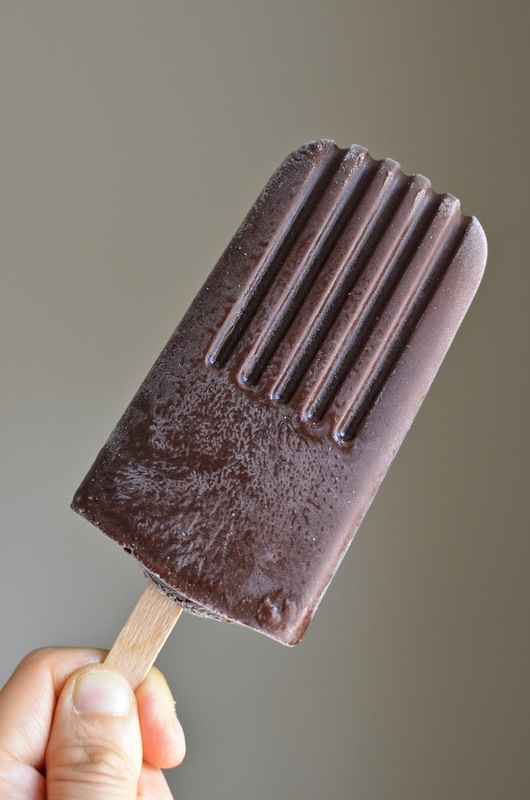 The result is a creamy yet icy popsicle filled with deep chocolate flavor. My young "chef" was pleasantly surprised by how good his popsicles were. I think he was a little worried and skeptical after having a taste of pure unsweetened cocoa (he asked to try it so I let him!). But once these pudding pops were done and he sunk his teeth into it, he resoundingly approved and wanted two popsicles in one sitting! This batch of popsicles went quickly. My husband and I were swooning a bit over these simple pudding pops ourselves. While it's entirely possible that our response had something to do with the fact that they were made by a very special fella, I think you'd agree they're better than any chocolate pudding pops you'd buy at the grocery store. This is the first time this year that I'm putting our popsicle molds to use and I'm sure glad we did. 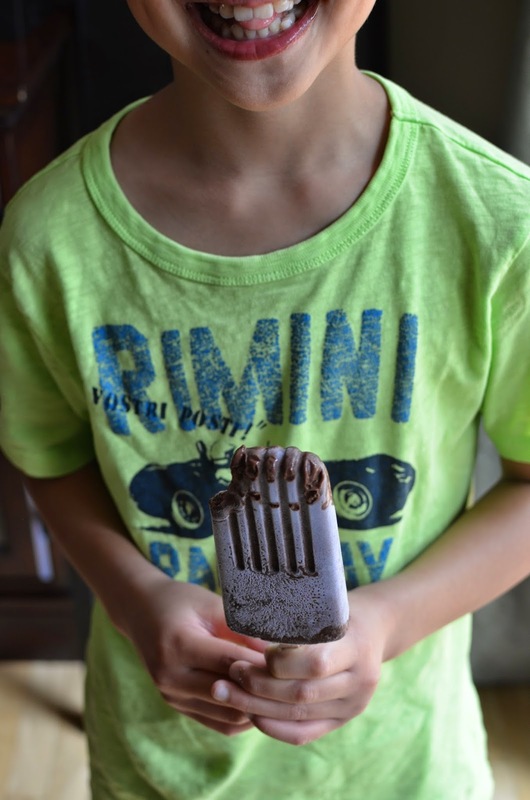 These chocolate pudding pops are fun to make with your child. And if your child is old enough (like mine, at 9), he can practically do all the work! And the funny thing is, once they get into the kitchen, they want to do it all from measuring out the sugar and cocoa all by themselves to pouring in the milk and stirring everything together. Once the ingredients are mixed together, the pudding needs to cook on the stove, whisking constantly, for about 8 minutes. My son did the entire cooking/whisking process (with my supervision...i.e., hovering). That's pretty impressive for a kid who typically can't wait to get back to some game or finish playing and whatnot. He got to see how the texture changed as the pudding started to bubble and thicken. Plus, he got to taste how some sugar and other ingredients transformed that bitter unsweetened cocoa into something entirely different! So you see...I hardly had to do much work beyond coming up with the idea and taking care of the setup (okay, and cleanup). What a treat this was - both the actual popsicles themselves and the time in the kitchen with the little one! As I mentioned, we just got back from Turks & Caicos and I can't resist dropping off a few pictures here. After all, there's no shortage of photos since my husband must have taken at least a thousand (he is the eager photographer in our house)! Vacation is always a treat and it always makes me grateful for home as well. My son is eager to tear into the one remaining chocolate pudding pop left in our freezer and I'm ready to get back in the kitchen. It may be back to reality and chores but I'm not complaining! Hope you're having a great summer! Place milk, sugar, cocoa, cornstarch, salt, and egg yolk in a medium-size saucepan. Whisk to combine. Place pan over medium-high heat and cook, whisking constantly to prevent lumps, until mixture turns thick and bubbly, about 8 minutes. Once cooled, divide mixture among six popsicle molds and freeze for at least 4 hours or until thoroughly solid. Remove the popsicles by running the outside of the molds under warm water for a few seconds. Wrap each with plastic wrap and place them into a freezer bag; store in the freezer to enjoy at your leisure. I love pops more than ice cream! I can tell how creamy and delicious from that bite! I hear you! Thanks, Angie. Thanks, Kelly. It really is beautiful there but I do miss home whenever I'm away, call me crazy! : ) You have a great weekend ahead and keep enjoying the summer. Great job! Your little chef must be so proud! My kids would love these. So happy to hear you had a nice vacation! Such a beautiful beach... I can dream of going there! We are on the same page. I just made some chocolate pudding pops. These really look so delicious and I just love that your son helped make them. That is so awesome. He definitely knows good stuff! Guess what, I have the same situation at my home. I have been quite busy this summer with our weekend trips but they are enjoyable at the same time. I love the chocolate pudding pops made by the budding chef. They really look awesome! Thank you, Balvinder. I hear you - summers are just super busy with a ton of things on the calendar but like you said, it's enjoyable and keeps life churning along. Enjoy! Oh those vacation pictures! That looks like one gorgeous view! I hope you had a wonderful wonderful time on your trip! I have been meaning to make pops like this for ages - and I just realized I have everything on hand to make them! Always such a great feeling :) Happy weekend! Hi Ashley - thanks! That view is kind of crazy...good thing my husband took a million pics so I can take a look back if I ever want to! These popsicles are so easy and light yet satisfying. Fun if you want to put your popsicle molds to use. Have a great weekend! This looks amazing! It has need so hot lately, I need this! A cold popsicle definitely hits the spot in the summer! Glad you had a great trip, friend!!! Chocolate pudding pops...! I want one now! Oh my. These look like the perfect summer treat! I totally need to try these! I am bookmarking this to make these in the future. I've been wanting to make popsicles! Oh my gosh - if you can find the time. I was non-functional for at least 6 months after I had my son. You take good care! What a beautiful summery post! The pops and the beach have me all excited. We have beaches all around us but I don't enjoy as much in winter. I don't think there could be a better project to collaborate with kids. A win win for all:-) They look fabulous. Your vacation pics are gorgeous! I probably wouldn't have returned home and would have just retired early (WAY early) surrounded by all that beauty. 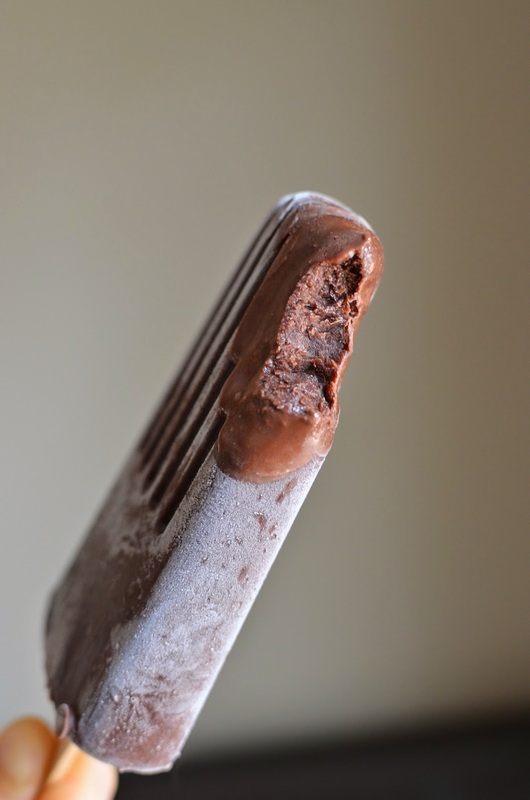 Chocolate pudding pops are such a childhood throwback food! Great for nostalgia...and for after dinner treats! Your chocolate pops look great Monica...and the pictures of your vacation are gorgeous! Thanks, Juliana! Hope you're having a wonderful summer. What a fun recipe and even better that your son got to help out! I would love to visit T&C sometime - looks beautiful! T&C was as beautiful as we'd heard so it was a nice getaway. : ) Cooking with your kid is fun, especially when they are into it and love what they made. Loving that last vacation photo and the blue sky and the blue green ocean. Okay now back to reality... LOL Your little guy is a sweetie and such a good little helper. Fudge pudding pops are one of my favourites so creamy and delicious! Yes, back to reality for me, too. : ) My little one sure has a sweet tooth, I know that much! ; ) And he loved these. Thank you! Monica, I admired these Chocolate Pudding Pops when you first published them but I have only recently got to my computer! They look and sound fabulous and such fun for your son to make. And what a lovely, exotic holiday too. Such fabulous views. It looks like you have had a great summer!! Thanks so much, Jo. The vacation was a nice break for sure. : ) I bet (and hope) you're having a great summer as well. your fudge pops (and your vacation!) look incredible! always nice to get away in the summer. Oooh, Turks and Caicos...very nice! I'm jealous. I wish I would have gotten to swim more this summer. Your son's smile in that first pic is totally adorable :) And I can see why he has such a big smile...i would too if I had one of these bars. I haven't had a fudge bar in SO LONG. Thanks, Amy! I loved capturing that smile, too. Those pops were a HUGE hit with him...probably almost as good as Turks & Caicos (okay, maybe not...). ; ) Hope you're treating yourself well...being pregnant is so restrictive, isn't it? I always thought it was the time to eat anything but turns out, it's when you have to watch everything!